This is my favorite comfort food for breakfast: soft-boiled eggs served with strips of buttered toast. It brings out the child in most people to imagine assembling forces and gathering the little army of toast soldiers to attack the soft-boiled egg fortress (I guess you could say the Duke of Shellington lives there). 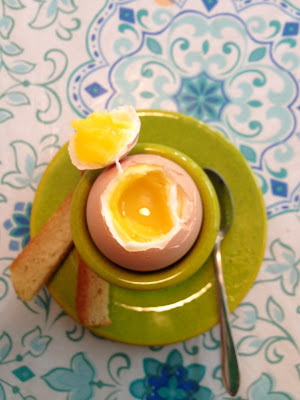 One person said, “A soft-boiled egg with toasty soldiers is food of the gods. The gods!” Yum. 1. Bring small pot of water to a boil. Using a spoon, submerge egg(s) into water. Set timer for 4 or 5 minutes. I like 4-minute eggs, myself. 2. While egg is boiling, put bread in toaster. When done, butter the toast (or spread of choice). On cutting board, cut bread into ¼ - ½-inch “soldiers” for dipping. 3. Line up your army of “soldiers” on the plate with the egg cup. 4. Remove egg(s) when timer goes off. 5. Place egg in egg cup. b. Tap around the “brim of the hat” with tiny taps until you’ve cracked it all the way around. Stick in the tip of the knife to lift off the hat. Sometimes it keeps a little hinge and stays open that way. 7. Sprinkle a little salt on the inside of the hat and scoop out with your tiny spoon to eat. Sprinkle a little salt in the egg and give the order to the soldiers! Start dipping into the yolk and eating. 8. Use the tiny spoon to scoop out remaining deliciousness. 9. Remember how wonderful you are!